The 'Second Disaster': Making Well-Intentioned Donations Useful After a crisis, not all of the help that's given is necessary: People send stuffed animals when they should be sending diapers. New ways of managing donations are now getting the appropriate help. 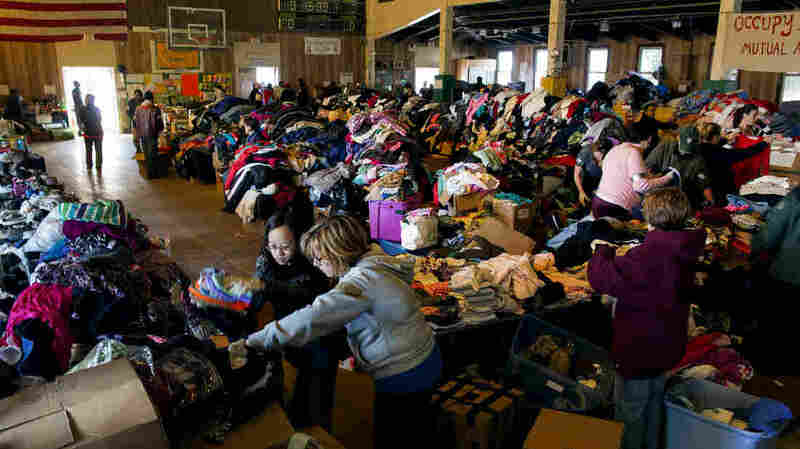 Thousands of food and clothing items are organized by Occupy Sandy volunteers in a school gymnasium in Rockaway Park, Queens, after Superstorm Sandy in November. Among the donations that poured into the American Red Cross building after the earthquake in Haiti three years ago was a box of Frisbees. In a flood of well-intentioned but unneeded donations, this box stuck out to Meghan O'Hara, who oversees in-kind donations for the organization. O'Hara says someone clearly wanted to help — the person mailed the box from Germany — but all she could think was, "Wow. That $60 or $70 could have been sent to so many different organizations to help out in so many different ways, and now we have a box of Frisbees." 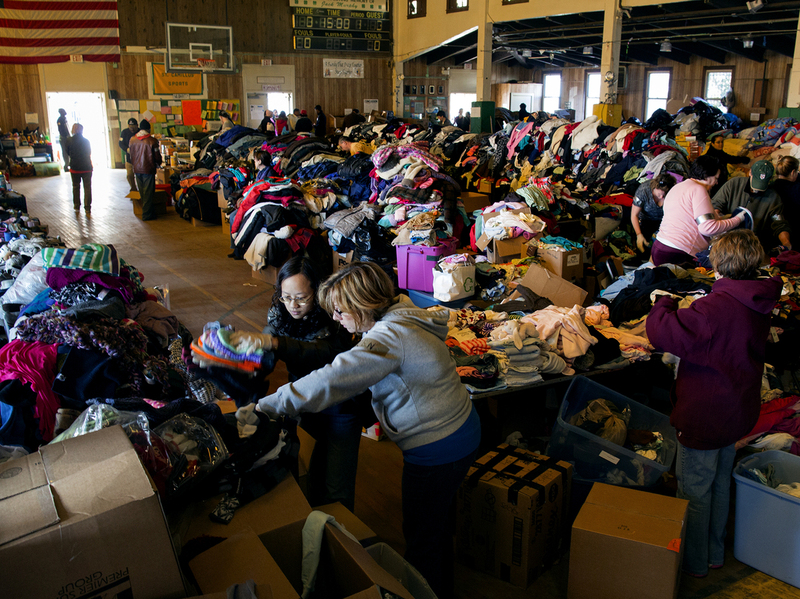 Disaster relief groups call this the "second disaster": the flood of unwanted donations, despite repeated requests for cash. In response to this recurring dilemma, organizations and volunteers are looking for new ways to bridge the gap between what donors give and victims need. One of the more interesting ideas came recently from three young friends who walked in off the street to volunteer in New York after Superstorm Sandy. "Really, our goal was just to make some sandwiches or something like that and then go home, and that would kinda be it," says 25-year-old John Heggestuen. But he and his friends were quickly swept up in the relief efforts of Occupy Sandy, an offshoot of Occupy Wall Street. They also soon realized that the operation could be improved. Donated clothes were pouring in, but victims needed diapers and cleaning supplies. "My friend Alex just said something along the lines of, 'You know, they need something like a wedding registry.' And as soon as I heard that, it clicked with me. I knew that was a great idea," Heggestuen says. So he borrowed a laptop and immediately set up a registry on Amazon.com. He listed items that Occupy Sandy needed and that donors could quickly purchase. The response was overwhelming. More than $1 million worth of donated goods were purchased, including some pretty expensive ones, like generators. "All of these things were bought right away," Heggestuen says. "It was just amazing." Now, Occupy Sandy has another online site where people can fund a particular cleanup project and keep tabs on how their money is spent. Bob Ottenhoff, president and CEO of the Center for Disaster Philanthropy, says this addresses what's often another big problem in disaster giving. "Individual donors don't know why they're giving or have unrealistic expectations about their gift," he says. Ottenhoff's center, formed by a group of foundations and donors, was designed to figure out how best to help disaster victims over the long run. "There's so much energy, so much generosity, so much passion that goes into disaster relief," he says, "we sometimes forget that once the disaster is over, the long, hard work of recovery and rebuilding still needs to get done." That could mean providing help with housing or services like day care. The center has collected $600,000 for Sandy relief so far and is now talking to those affected by the disaster about what kind of aid they really need.